FW 2011: the season of (vichy) checks and (black) leather. 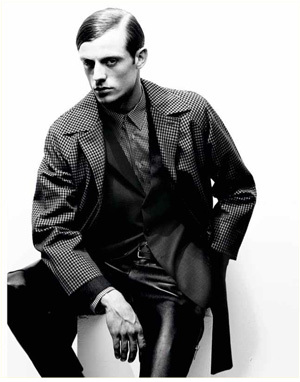 The grooming, inspired by the 30s, makes this total look, designed by Ennio Capasa for Costume National Homme, tough but charmant at the same time. Model Robin Van Der Krogt. Ph. Giovanni Gastel, Styling Alessandro Calascibetta.